Silver coin from Livonia in the Post-Medieval period, most likely the 1530s. 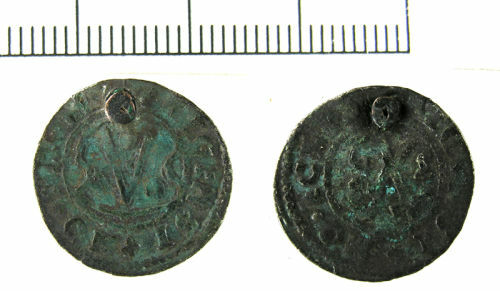 it has been minted in Riga, possibly by the Archbishop at the time. The coin has been pierced and has a nail through the hole. Obverse description: Shield with a design consisting of an inverted V and small pellets.